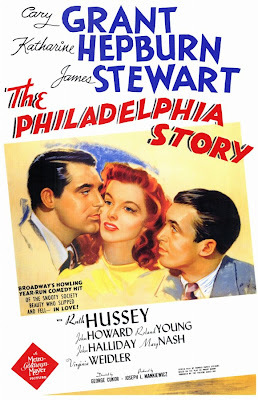 Poster For Best Picture Nominee The Philadelphia Story (1940). As already reported here by Book Patrol's Stephen J. Gertz, the theme of the upcoming 43rd California International Antiquarian Book Fair is From Author To Oscar®. 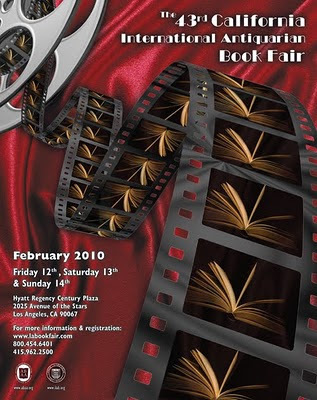 To be held February 12-14 2010 at the Hyatt Regency Century Plaza in Los Angeles, the largest rare book fair in the world is "focusing on the symbiotic relationship between books and film." Since most of the Best Picture Academy Award®-winning films are based on literary works, the Academy of Motion Picture Arts and Sciences Margaret Herrick Library was the perfect place to conduct research for the movie-themed fair. The library staff was even gracious enough to loan some of their priceless artifacts for display at this year's festival of rare books. As an early thank you note and valentine from book lovers, two of the Herrick Library's fascinating film-related exhibits are in today's spotlight. The Featured Poster From The Margaret Herrick Library's Exhibit. 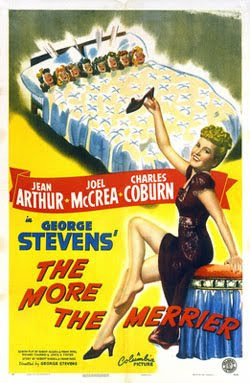 The More The Merrier (1943). Now on view at the Academy's Grand Lobby Gallery in Beverly Hills is The More the Merrier: Posters from the Ten Best Picture Nominees, 1936 – 1943. The exhibit is a tribute to this year's big change in the annual Oscar nomination process: ten motion pictures are competing for Best Picture honors rather than the five tapped for the last six decades. What even the most savvy Oscar devotees may not know is that the number of Best Picture nominees ranged from three to twelve from 1927 to 1943. Only in 1944 was the number set at five, where it remained until 2009. 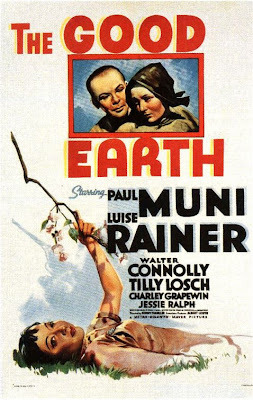 Poster For Best Picture Nominee, The Good Earth (1937). Based On the Novel By Pearl Buck. The Academy’s poster exhibition spotlights the eight consecutive years during which there were ten Best Picture nominees. The films represented in the exhibit include many based on books or plays: Romeo and Juliet (1936), The Philadelphia Story (1940), The Maltese Falcon (1941), Kitty Foyle (1940), You Can't Take It With You (1938), The Good Earth (1937), The Human Comedy (1943), The Wizard of Oz (1939), Gone With The Wind (1939), Rebecca (1940), and Our Town (1940), to name just a few. 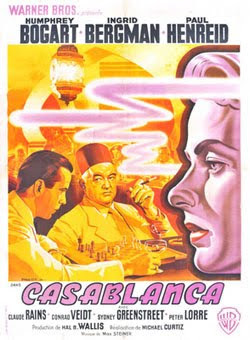 Artist Pierre Pigeot's French Poster For Casablanca (1942). Famed artists and illustrators whose work is on display in the gallery include Boris Grinsson, Pierre Pigeot, Jacques Kapralik, Ercole Brini, Norman Rockwell and Al Hirschfeld. Highlights of the show include an original painting created by Sergio Gargiulo for Gone With The Wind, an exceedingly scarce 3-sheet poster for The Great Ziegfeld (1936), and a promotional presentation created for the British release of Lost Horizon (1937). This free exhibit of rare and beautiful movie posters from around the globe will continue through April 18, 2010. 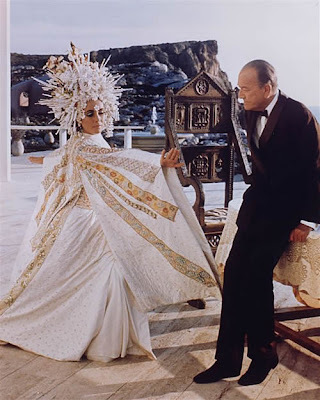 Noel Coward And Co-Star Elizabeth Taylor On The Set Of Boom! (1968). On display in the same building, but in the Academy's Fourth Floor Gallery from now until April 18, 2010, is Star Quality: The World of Noel Coward. The always modest Mr. Coward, playwright, composer, director of stage and screen, actor, singer, painter and possible war-time espionage agent, once remarked: "Star Quality: I don’t know what it is, but I've got it." Judge for yourself if his high self esteem was warranted by paying a visit to this comprehensive exhibit covering all aspects of his wide-ranging talents. 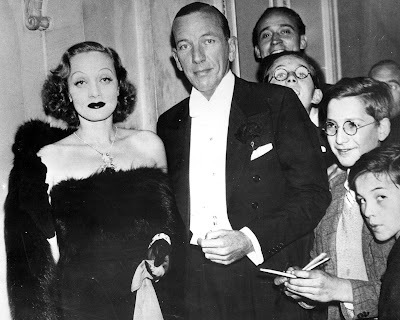 Noel Coward and Marlene Dietrich in 1937. Assembled through previously unparalleled access to the Coward Archives, drawing on public and private collections from around the world, and enriched by the Margaret Herrick Library's extensive holdings, the free exhibition brings together a never before seen collection of dozens of rare photographs, drawings, paintings, manuscripts, letters, sheet music, posters, playbills, set and costume designs, memorabilia, audio and video clips, and original costumes, including several of Coward's trademark silk dressing gowns. It offers unique insight into the man who gave us theatrical gems like Private Lives and Blithe Spirit, timeless tunes like Mad Dogs And Englishmen and Mad About The Boy, and unforgettable films like Brief Encounter (1945) and In Which We Serve (1942). The 43rd California International Antiquarian Book Fair Is Oscar Bait.